Video interview with Jaclyn Bateman in the brewery tasting room. Owen Ogletree is a national beer judge and beer writer for Southern Brew News and ClassicCityBrew.com. He is also the founder of the Classic City Brew Fest and the Atlanta Cask Ale Tasting. Bateman's roots extend back to 1874 when George Bateman and his wife Suzanna sold their farm and rented a small brewery in Wainfleet. In 1880, the brewery was relocated to the coach buildings surrounding Salem House - a Georgian House very near the original brewery location. Batemans grew throughout the years and survived the downturn of cask ales in the dark period surrounding the 1960s and '70s (when fizzy, pasteurized, keg beers began to gain favor for some reason). Near the end of the 1970s, the efforts of CAMRA (The Campaign for Real Ale) helped solidify the presence of real, cask-conditioned ale in pubs throughout the UK and ensured a future for small, real ale breweries like Batemans. George Bateman, the grandson of the founder, took over the company in 1970. In 1985 George's brother and sister decided they wanted to sell their shares in the business, and George worked extremely hard to buy his siblings out and save the brewery from takeover by larger brewing corporations. In 1986, Batemans XXXB won "Beer of the Year" at the Great British Beer Festival, and the award helped George settle the shareholder dispute and retain brewery ownership and control. George's wife Pat joined the brewery team after their children had grown up, and son Stuart soon became Managing Director, with daughter Jaclyn taking on the role of Marketing Director. Pat died in March of 2005, and in June of 2007 George also passed away. Stuart and Jaclyn are still very much involved in the brewery, and Brian Bean, who was Deputy Chairman, became Chairman of Bateman's Brewery in September of 2007. Batemans has 68 pubs in the area around Wainfleet and Boston, UK. The picturesque brewery that sits underneath an old, brick windmill in Wainfleet offers visitors a bar, bistro, artifacts room, gift shop, pub games and brewery museum. The visitors center is open seven days a week, 11:30 AM to 3:30 PM, with food served 12:00 PM to 2:00 PM. Brewhouse tours are conducted each weekday at 2:00 PM and additionally at 12:30 PM April 1 through October 1. Parties of 12-36 are able to arrange special evening brewhouse tours that include beer samples, brewery supper, and use of all facilities and attractions. There are also entertaining weekend group tours that can be booked to include one or two nights at a local B&B. The Bateman's visitors center provides the ideal location to enjoy the full range of the brewery's excellent cask ales including Batemans XB Best Bitter, Dark Mild, XXXB Premium Bitter, Valiant, and Salem Porter. Quite light in alcohol, yet rich, complex and flavorful, Batemans Dark Mild is one of my favorite cask beers in the UK. Batemans plans to export two flavorful bottled beers to the USA early in 2009 - XXXB and Combined Harvest. XXXB is a premium ale with notes of caramel, toast, malt complexity and traditional hop aroma, flavor and bitterness. Combined Harvest is quite a unique ale that is made with four different grains - barley malt, malted oats, malted rye, and malted wheat. The result is a scrumptious golden ale with a very pleasing cereal complexity and floral hop aroma and flavor. Look for these two beers on the menus at better pubs and restaurants in the USA and on shelves of upscale beer retail shops. 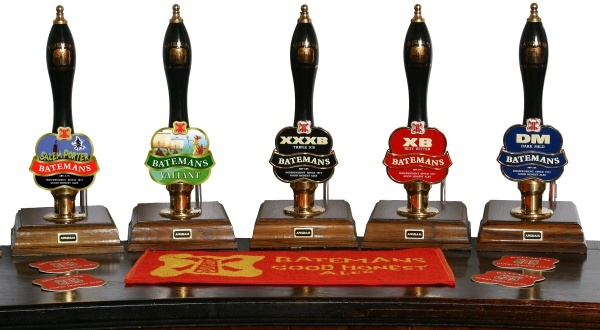 Click here for information about the entire Bateman's beer range. Owen: What challenges have you encountered in exporting your brands to the USA? Jaclyn: Competition and gaining awareness of your brands. There are different markets everywhere, and we just want people to taste our beers and give them a try. Our labels stand out and make for good presentation, and this helps get the attention of people who may have never tried our beers. Mark: Competition is difficult - beer aisles in stores can go on for miles. I think it was a good idea for Batemans to start off with exporting only two of our most memorable brands. Owen: English ale sometimes is a very fragile product. What steps does Batemans take to make sure their bottles have a good shelf life? Mark: We fill just before shipping and always try to schedule filling just before the beers go out. It can be hard work organizing this type of timetable. Currently, Batemans exports to USA, Spain, France, Sweden, Russia, Brazil and Denmark. Owen: Talk about the Combined Harvest. Mark: This is a wonderful beer that's been going for about five years, and people have given it great reviews - especially people not used to traditional English ales. Because of the varied grain bill, Combined Harvest has a unique character - especially for a bottled beer from the UK. Owen: How do your bottled beers compare to cask ales? Jaclyn: The taste of our bottled beers will be as close to our cask versions as possible. The recipes and alcohol contents are the same, but the bottles will have a bit more carbonation. Owen: How are your traditional, cask ales doing in the UK at present? Jaclyn: The trend is growing, and all the reports show that more and more people are trying and enjoying cask beer. We are doing everything we can to promote the product - like organizing more exhibitions where people can meet the brewers. We are also trying to get out into pubs marketing our beers and getting more people to try them. We also do training's at the brewery for interested parties who would like to run their own pub. My brother is very knowledgeable and 'into beer' - he is very passionate and has worked at the brewery in some capacity since he was five years old. Owen: Your father was very popular in the beer world - partly due to his starring role in an episode of the Michael Jackson Beer Hunter video series. When you make decisions regarding the brewery, do you often think of what your father would do? Jaclyn: It hasn't been that long since my father passed away, and my brother and I do work hard to follow Dad's ethos - we do it because we want to. Owen: What's been your most award-winning beer? Jaclyn: XXXB. It is full flavored and well balanced with malt and hops. It is our best selling beer in the UK, and it's rare in this country for a brewery's stronger beer to outsell the lower alcohol bitter. Owen: Other than XXXB and Combined Harvest, are there any plans for more beers to be exported to the USA in the future? Jaclyn: Victory and Dark Lord (a strong beer similar to Salem Porter) are probably not far behind in our export plans. Those two should do very well in the American market. We really don't want to do any new beers for the USA - we just want to start slowly and not fragment the market. Owen: How important has CAMRA been to your brewery? Jaclyn: Without CAMRA, we wouldn't be here today. In the 1970s, kegged beer trends were very harmful to our traditional business. Cask breweries would not have survived without the efforts of CAMRA to preserve cask-conditioned ale in the UK. Batemans even started a kegging plant back in the 70s, but gave that up when cask beer came back into fashion. CAMRA was also very supportive when we had family ownership struggles back in the 80s. Owen: If you could change one thing about the beer business in the UK, what would it be? Jaclyn: I would love to see more women involved in English ale. I wish women in the UK would see traditional ales as more of a part of their lives, and I also wish women didn't think that beer would give them beer belly. You get the belly from what you eat with the beer. It's a teaching process for me - that great beer is not just a male drink. Owen: What pleases you most about having a brewery? Jaclyn: Everything. All the people we meet from all walks of life - I enjoy all of it, except for all the red tape in the UK - and the red tape seems to be getting worse all the time. Mark: We have a huge variety of beer styles in the UK - it's very impressive. Variety makes us what we are. Owen: What would you want to tell USA beer lovers to persuade them to try your bottled XXXB and Combined Harvest? Mark: The unique character of the Combined Harvest must been tasted. It's like no other English beer. Jaclyn: Our XXXB is very true to style, drinkable, and well balanced. It exhibits everything that is classic about a pint of ale in England - find out for yourself - see what you think. This lovely, vine-covered windmill sits above the Batemans circular windmill bar at the brewery. Casks are stored in the brewery yard - waiting to be filled with the wonderful Batemans ales. Batemans Brewery still offers employees a pint of their light ABV bitter during work. The brewery's employee tap is pictured above. This Batemans family portrait hangs on a wall of the windmill bar and shows (L-R) Pat, Stuart, Jaclyn and George enjoying a pint of their award-winning XXXB. Jaclyn Bateman stands among relatively new equipment in the Batemans brewhouse that was renovated in 2002. Only the finest malts are used in the production of the Batemans range of ales. Batemans utilizes the traditional method of open fermentation in the production of their ales. Traditional ale yeast gives the beers a delightfully complex, fruity character. These clean casks are lined up and ready to be filled with Batemans XB Best Bitter. Cask beer has a secondary fermentation that occurs in the cask that provides a natural, soft carbonation. The new brewhouse is nicknamed "The Theatre of Beers," and beer writer Roger protz was present at opening ceremonies in 2002. Brewery memorabilia, documents and a fine bottle collection adorn the walls of the circular windmill bar at the brewery. The Brewery Experience museum at Batemans is a fun and informative walk through a simulated brewery world. No trip to Batemans would be complete without visits to the welcoming Batemans pubs of the area. Pictured above is Marie, cellarmistress of the Freiston Kings Head Pub. Marie does a marvelous job in tending to the Batemans casks in the pub cellar.